Princeton University Press, 9780691182810, 464pp. Humans possess an extraordinary capacity for cultural production, from the arts and language to science and technology. How did the human mind--and the uniquely human ability to devise and transmit culture--evolve from its roots in animal behavior? Darwin's Unfinished Symphony presents a captivating new theory of human cognitive evolution. This compelling and accessible book reveals how culture is not just the magnificent end product of an evolutionary process that produced a species unlike all others--it is also the key driving force behind that process. 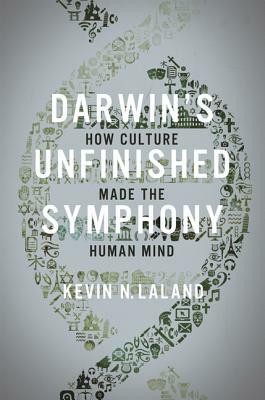 Kevin Laland shows how the learned and socially transmitted activities of our ancestors shaped our intellects through accelerating cycles of evolutionary feedback. The truly unique characteristics of our species--such as our intelligence, language, teaching, and cooperation--are not adaptive responses to predators, disease, or other external conditions. Rather, humans are creatures of their own making. Drawing on his own groundbreaking research, and bringing it to life with vivid natural history, Laland explains how animals imitate, innovate, and have remarkable traditions of their own. He traces our rise from scavenger apes in prehistory to modern humans able to design iPhones, dance the tango, and send astronauts into space. This book tells the story of the painstaking fieldwork, the key experiments, the false leads, and the stunning scientific breakthroughs that led to this new understanding of how culture transformed human evolution. It is the story of how Darwin's intellectual descendants picked up where he left off and took up the challenge of providing a scientific account of the evolution of the human mind. Kevin N. Laland is professor of behavioral and evolutionary biology at the University of St Andrews.